Renting sports equipment when you travel, or staying in hotels with gyms or arrangements with a gym or a pool nearby is one solution. But there are also some inexpensive easily packable options for exercise on the road that keeps you both fit and focused. Obviously packing equipment like exercise balls and free weights isn’t always the best choice. Apart from the fact it can be challenging to fit an exercise ball in your suitcase, many airlines now have drastically limited size and weight restrictions for your luggage. Thus it’s important to pack equipment that is lightweight and small. Exercise Tubes are great because they are effective, affordable, easy to use and lightweight while you travel. Fit Tube, Ankle Tube, Physio Toner and a door attachment takes up little space once tucked into its travel bag. Then, no matter where you are — from hotel room to a rooftop deck — you have the option of standing on the band and doing arm curls and overhead presses, attaching it to a door for pull downs and push downs. The classic Jumping rope is another great suitcase friendly piece to pack. Skipping for 30 minutes can burn up to 600 calories! 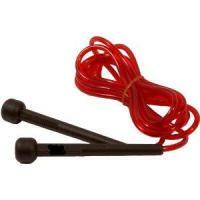 Jumping rope is also a lot of fun and can be done in your room or outside in the sun. You can skip in a number of different ways to challenge different muscles or add a jump rope session in after your resistance band workout to get a serious calorie burn at the end. 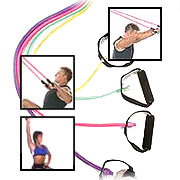 Jumping rope is a high-intensity cardiovascular workout that requires balance, strength and agility. 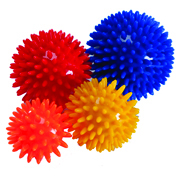 Massage Balls will help you feel “at home” after a day of work or play. Four sizes are available to let you massage small and large muscles with different levels of intensity. Their small size also makes them great for squeezing for general stress relief. Running Shoes: Wherever your destination is, there is always a road to run on. When in a new city, running around town is the perfect way to sightsee while getting a workout in at the same time. For those who don’t think they can fit one more thing in their suitcase, it is recommended to take just one small object with you on vacation that will help you to exercise. “A measuring tape,” Put it around your waist. If the number is higher on any given morning, start walking.